When looking to make that simple iPhone snapshot into art, the app many photographers I know turn to again and again is TiltShift Generator by Art & Mobile. Shift in Focus: Use the Blur tool in TiltShift Generator to make adjustments to photos on your iPhone or iPod touch. The keys here are selective focus and depth of field, often produced by expensive DSLR cameras and lenses. Now, the average iPhone user may have no idea what these mean, but photographers know what I’m talking about, and many of them spend ample amounts of time and salary trying to get it. TiltShift Generator gets it right on the iPhone, and even if you have no idea what this stuff means, you are going to like the results. TiltShift can take a picture from within the app, or, for you iPod touch users, edit one from your library; full resolution is supported, as is working in landscape mode. Once you’ve got your image, start by working with the Blur tool. This adjusts the focus right where you want; you can move and resize with a pinch. There is also a radial and a linear blur to try out for different effects. Once you’ve got the blur where you like, try the three color adjustment tools: saturation, brightness and contrast. These work OK for being included with the app, but you may want to make more detailed adjustments elsewhere. Use the vignette tool for some final adjustments and you’re done—instant art. 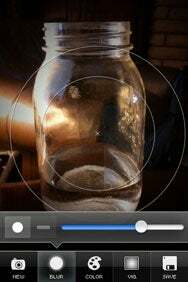 From within the app you can send your image to e-mail or Twitter or, after a recent update, upload it to Facebook. You can also save the final product to your photo library. TiltShift Generator produces a final product that is simply amazing. A $1200 DSLR in a $1 iPhone app? Well, not quite, but TiltShift Generator is a lot of fun and certainly worth an add to your iPhone photobag.